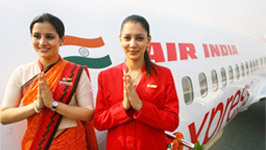 Air India SATS Airport Services Pvt. Ltd. (AISATS), India’s premier airport services company, has completed ten years of providing airport services at the Kempegowda International Airport in Bengaluru. In the last decade, AISATS has played a significant role in adopting and implementing several technological and digital innovations to its ground and cargo handling operations, thereby bolstering the status of Kempegowda International Airport as the Gateway to South India. AISATS is the only airport service company at Kempegowda International Airport that provides comprehensive ground and cargo handling services, and serves seventeen international and five domestic airlines. Since the inception at Bengaluru, AISATS has handled 125,867 flights and 1,094,284 tonnes of cargo. Apart from providing services to scheduled passenger and cargo airlines, AISATS also specializes in handling charter flights. In addition to operating the largest Air Freight Terminal at Kempegowda International Airport with a capacity to handle 210,000 tons of cargo per annum, AISATS has also established India’s first integrated on-airport perishable cargo handling centre, the AISATS COOLPORT, with a capacity to handle 40,000 tons of perishable cargo per annum. With in-house facilities of dedicated X-Ray machines, a Drug-Controller Lab Testing facility, Plant-Quarantine Inspection & Certifications, and a Customs Clearance facility, AISATS COOLPORT offers one-stop solution for perishable cargo handling and also helps in reducing cargo dwell time considerably. Since the inauguration of the AISATS COOLPORT in October 2016, till date, it has handled 28,000 metric tonnes of perishable cargo (export and import). In the last decade, AISATS has adopted numerous steps to upgrade and integrate its services with technological advancements in order to keep pace with the fast-track cargo movements across domestic and international boundaries. These innovations have not only helped in bringing service efficiency to AISATS’ operations but have also helped the company to establish and maintain a culture of sustainability and environmental responsibility. Some examples of these technological innovations and advancements are the use of Automatic Storage and Retrieval System (ASRS), and a Very Narrow Aisle (VNA) High Rise Racking system, biodiesel operated forklifts to reduce carbon footprints and IATA e-freight compliance for paper-less cargo movement. AISATS has also indigenously developed Cool Trollies to minimise the temperature excursions while transporting temperature sensitive cargo between the warehouse and the aircraft. Moreover, AISATS has also launched the Cargo Tracking Mobile App to increase efficiency of the supply chain by relaying relevant information of cargo shipments to various key stakeholders. AISATS is currently in the testing phase of incorporating Radio Frequency Identification (RFID) technology within its operations in order to track cargo movements automatically. AISATS has earned various certifications over the past decade, such as ISAGO (IATA Safety Audit of Ground Operations), ISO-9001:2008 (International Standard Organisation), TAPA (Transport Asset Protection Association), GDP (Good Distribution Practices), and HACCP (Hazard Analysis and Critical Control Points), and Air Cargo Regulated Agent (RA) by the Bureau of Civil Aviation Security (BCAS). These certifications recognize AISATS’ commitment and efforts towards applying world-class ground and cargo handling standards at Kempegowda International Airport, Bengaluru. As a testament to its endeavour and commitment to deliver excellence in airport services, AISATS has won several accolades such as the Best Air Cargo Terminal Operator Award for six times by ICC (Indian Chamber of Commerce), Best Ground Handler Award twice at India Cargo Awards-South and West, Warehouse excellence awards at 9th Express Logistics & Supply Chain conclave, and Best Ground Handler and Best Air Cargo Service Provider at the Ministry of Civil Aviation’s (MoCA) flagship event Wings India 2018. AISATS understands its responsibility for the community where it operates and provides employment opportunities to local people of the surrounding villages of Kempegowda International Airport. AISATS has also supported the repair and renovation work of Government Junior College at Vijayapura village in Devanahalli Taluka. Apart from this, a skill development program was launched in the field of food processing with an aim to empower the unemployed women of Devanahalli village near Bengaluru Airport.